Goldrush on the day she was discharged to return home. 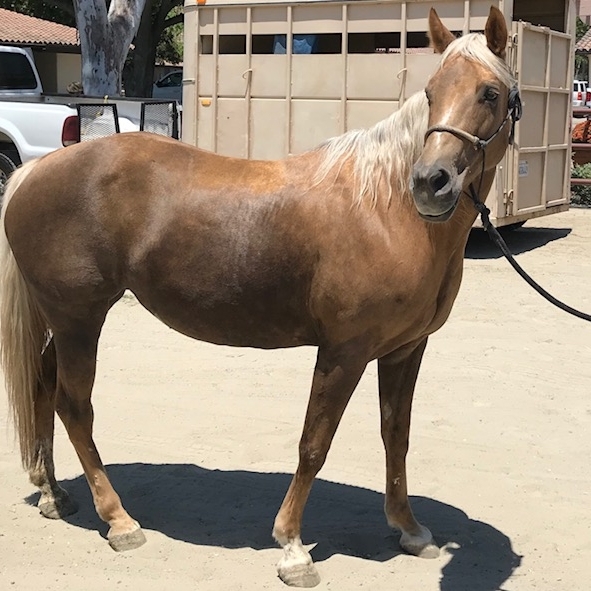 Goldrush, a beautiful 21-year-old dark palomino mare, came to Alamo Pintado late one night in April after several days of intermittent fever and lethargy. An ultrasound was performed, which showed an abscess by her sternum. She was diagnosed with Peritonitis and subsequently treated with antibiotics. After initially responding well, she began to show signs of low-grade colic after her first week at the hospital. When medical therapy did not succeed in relieving her colic, Goldrush was placed in the hands of our surgical team for exploratory surgery. During the procedure, surgeons discovered that her large colon and tip of her cecum were adhered together and attached to the body wall by the sternum. These abnormalities were due to a penetrating wire which was causing an abscess. The wire was removed as Dr. Troy Herthel slowly freed the colon and cecum from the body wall and associated abscess. Upon culturing, the abscess returned three different forms of bacteria, and Goldrush then underwent a large colon resection, with the tip of her cecum being removed as well. After a 5-hour procedure, Goldrush was slowly brought out of anesthesia and was able to stand within 3 hours. She underwent extensive medical treatment post-operatively, which included a blood transfusion and many days of abdominal lavage. 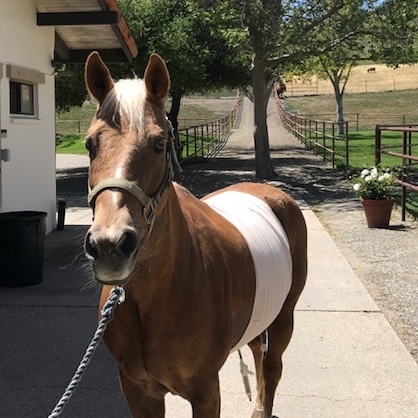 Goldrush made a successful recovery and was discharged from Alamo Pintado Equine in mid-July with an additional 4 weeks of antibiotics to continue at home. Her rechecks have shown slow shrinking of the residual abscess. The internal medicine and surgical teams were able to work together to return Goldrush to health, and we’re so happy to see her doing well. The wire that was discovered during exploratory surgery.